Hello all, hope you're all able to enjoy the day. I'm taking a break from weed wacking. The past few quilts I've finished have been bound by machine and I can honestly say that I'm not very good at it. So on this quilt for my hubby I decided to do it by hand. I made a few changes and finally found what works for me. When I made the binding I didn't press it flat...I just put the edges together and basted it closed. 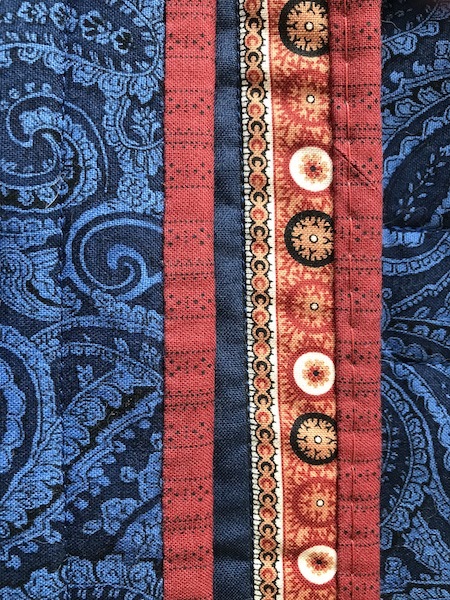 Instead of pressing the binding flat after getting it on the quilt (I was afraid of damaging the Poly batting), I used a long machine stitch to get it to lay flat. I figured it would be less stress on my hands. It really worked. Then instead of using the traditional stitch (forget what it's called) I used a ladder stitch. Finally, I had purchased a few packs of different needles to use instead of the old Singer needles I've had for years. 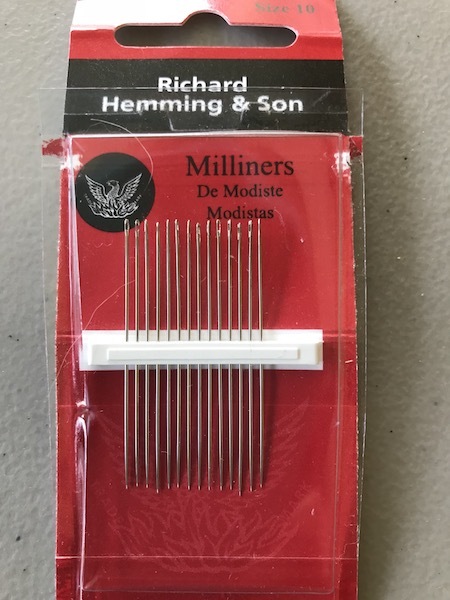 I'm using a Richard Hemming & Son Milliner's needle. I never would have thought that the needle I use would make such a difference. It's flexible and seems to fit my fingers well. It's actually going so well I didn't want to stop to do yard work. Oh, and because I didn't press the binding, it's much easier to pick up the edge to stitch. So even though I find it faster to do a binding by machine.....I'm thinking I'll stick with this until I can figure out where I'm going wrong. Nice job! I usually machine stitch my binding on the front and hand stitch it to the back. If I do an all machine binding, I use the QB tutorial Quick Machine Binding with flange. IF I match the top stitching thread colour to the backing fabric, it makes a very nice machine binding. Barb, that looks wonderful. I have a terrible time with machine binding. I can do one side but have to do the other side by hand or else it looks awful and that can really hurt the beauty of a quilt. I struggle with machine binding but tough it out on anything bigger than a table runner. I find flange the easiest to hand stitch but limit that to smaller projects. It takes practice, just like everything quilt related. I decided I was going to teach myself to sew binding on by machine and I did. My fingers cramp when I do hand sewing so I don't. Although I actually enjoy hand binding to the back, when I machine bind, I always use a flange binding. And a stitch in the ditch foot. I'm with y'all. I machine stitch and then hand stitch the binding to the back. I use whatever needle I can find. I had no idea there were fancy and better needles out there. I'm heading to the LQS to get some now... well, not really "now". It's 3:30 AM. I'll wait for daylight! I only machine bind baby quilts and runners...the rest I do by hand. Barb, your binding looks great, have you already posted pictures of your finished quilt? I love the colors. I struggle with machine binding too. A few of the charities I quilt for recommend machine binding.....so I'm determined to make mine look better. So......after much pondering, I purchased the Martelli binding system...it came with a bunch of things in a cute little bag. I'm afraid to try it.......but once I get these 2 baby quilts quilted.....I'm going to pull all those things out, read the directions and dive in. Will be in about 3 weeks...so I'll let you all know if I spent money wisely or if I just got a really cute bag! I only use machine binding for utility quilts as I can never get the line straight. I do all my bindings by hand. My experiences with machine binding have been close to fatal. Looks great!! Aren't milliner's needles fantastic? I use them almost exclusively for my hand work (including embroidery, hand binding, etc). Haven't tried that brand, I will look for them.